Each year, the Richmond sports community recognizes outstanding individual and team achievement in local sport. The 2018 Awards Gala Dinner to announce and honour the finalists and winners of the 2018 Richmond Sports Awards will be held at McMath Secondary School on Thursday April 25th 2019 at 6.30pm. 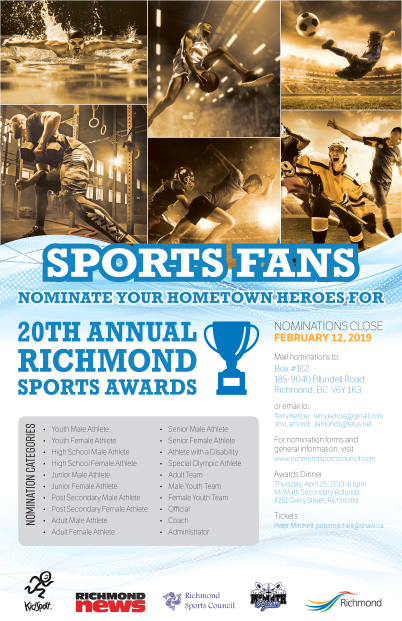 Find more details and buy tickets by clicking this Richmond Sports Awards link. Richmond's 50 community sports groups offer quality, affordable sports opportunities to adults and youth. Click Here to contact a sports group and start playing. Every year, Richmond KidSport ensures over 280 children from low-income families can play sport. Since its founding in 2008, over $500,000 has been provided. Read KidSport Richmond's latest Newsletter by clicking here. To donate or volunteer, please phone 604.812.4042 or see kidsport.ca/richmond To apply for KidSport funding, follow the "Grants" link on the right-hand side. In 2005, Richmond Sports Council proposed to the City that Richmond institute a Sports Hall of Fame to celebrate the successes and contributions of members of the Richmond sports community to our city. This dream came to fruition in 2015 through the "Richmond Sports Wall of Fame" at the Olympic Oval. Sports Council is the overseeing body for the Nominating Committee,and encourages Richmond's sport community to nominate members deserving this recognition. Click for more information.